Vetiver 46 was created for Le Labo by Mark Buxton, the author of several Comme des Garcons scents including Comme des Garcons and Comme des Garcons White. 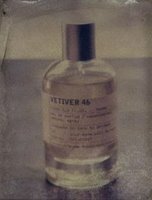 (Those who followed the blind fragrance testing experiment conducted by Patty, March and myself might recognize Vetiver 46 as Doctah, one of the samples sent to us by Patty. March and I loved Doctah, however Patty thought it was “just nasty… embalming fluid in a bottle”) Described by Le Labo as “the Rolls Royce of Vetivers”, Vetiver 46 has notes of vetiver, olibanum oil, cedre oil, labdanum absolute, amber, bergamot essence, vanilla, black pepper, gaiac wood, and clove. It is marketed by Le Labo as one of their masculine fragrances, in fact “as the most masculine of all Le Labo creations”. The description goes as far as to say that “among the 46 essences that make it up, all have the distinctive “male” scent: pepper, gaiac, labdanum, cedar”…That list pretty much covers my favorite notes. As a female, in answer to that I will quote my beloved Nero Wolf and say, Pfui! As you may have garnered from the above outburst, I regard the feminine-masculine distiction in perfumery to be pretty much passé and unnecessary. In the name of fairness however, I must add that, compared to other recent releases with a prominent vetiver note, Terre d’Hermes and Sel de Vetiver, Vetiver 46 does strike me as a drier, harsher, more austere composition, and whereas I cannot imagine anyone not consider Terre d’Hermes or Sel de Vetiver to be “unisex”, I can understand why Vetiver 46 might be deemed “masculine”. As for the scent itself, it is superb. Vetiver 46 starts with incence, citrus and vetiver, a dry, bright, bracing accord with a slight salty undertone. As the fragrance developes, the harshness of the top notes subsides and while the fragrance never becomes soft and fluffy, it does acquire a certain smooth, warm(-er) quality, undoubtedly due to the presence of vanilla and amber. All stages of Vetiver 46 are wonderful, but I absolutely adore the drydown. Spicy with pepper and cloves, dark and resinous thanks to the gaiac wood note, it has a sligh smoky feel to it that I find irresistible. I have not given all Le Labo scents a try on my skin yet, but of the ones I have sampled so far, Vetiver 46 had the most interesting, unusual composition. Vetiver 46 is available at Le Labo boutique, $45.00-$180.00. The image is from Lelabofragrances.com. Tomorrow, Vetiver Bourbon by Miller Harris. First, I`m very glad to find you on the Vetiver wave as it is my favorite note for some years. Second, you open some new niche scents for me and I really appreciate that (even though I got no idea how to make my expanding wish-list to come true on shelves, I shall do it anyway: somehow, someday my dreams will come true). Bad news: They rejected my letter about sampling program today as they do not accept Western Union... Well, I`ll ask friends for it. So, I`m waiting for your other reviews of vetiver scents. (I can recommend to try Adolpho Dominguez, it is bright and sparkling flowery vetiver). oh dear. I am in deep here. I get to New york at least twice a year and I fear that this is a place that I may drop some cash. I am so wanting to sample this!Sounds like its the dry down that I'll be craving.Thanks again for a fantastic review! The drydown is wonderful! I can't figure out if I think you will like the rest of the scent...I am really not sure, but it is worth trying anyway! LOL, it was bound to happen eventually that we would do the same fragrance on the same day. So is it silly if I say nice choice? And I have NOT changed my mind. I opened it up again to see if I can find what you guys love so much, and I've decided my nose must be damaged on one note that is in there, because it is just wretched for m, and that makes me so sad! OK, I guess I have to give these Labos a try, in spite of my skepticism.